The nurse shark is also known as Ginglymostoma cirratum in the scientific community, and can reach a length of 14 feet and weigh 330 pounds. Its family name, Ginglymostomatidae, comes from the Greek word γίγγλυμος which means hinge and στῶμα meaning mouth. The shark’s skin is very tough and is often sought after for its leather. The nurse shark is a common bottom-dwelling shark, and can be found near the shore in tropical and subtropical waters in the Atlantic and Pacific oceans. It loves reefs, sand flats and channels, hunting at night and is inactive during the day resting in groups. Nurse sharks eat crustaceans, mollusks, sea snakes, stingrays, and even squid. 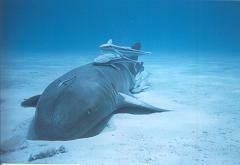 This is how the Nurse Shark probably got its name. In medieval times, any shark or dogfish was generally called an hurse (with a silent h) because archers prized their oily skin for when they wanted to hurse (“smooth and polish”) arrows. Over time, an hurse became “a nurse,” and the term slowly became applied to the one species as people developed other uses and other names for the individual species. Nurse sharks are able to breathe while staying in the same spot by pumping water through their mouths and out their gills. How Sensitive Is a Shark’s Sense Of Smell and Can a Shark Smell Blood From Far Away In the Water? What is the Most Dangerous Shark Species in the World to Humans and Where do they Live?